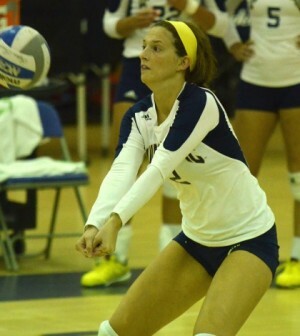 The Quinnipiac volleyball team was defeated in straight sets during its non-conference matchup against the University of Massachusetts Lowell on Wednesday night. In the first set, the River Hawks had 14 kills and five errors while the Bobcats only had 8 kills to go along with seven errors. The River Hawks won the set 25-17 and took the lead all the way to the end of the match. In a nearly identical second set, UMass Lowell had 11 kills to Quinnipiac’s seven while the Bobcats had nine errors to the River Hawks’ four. Again, the set ended 25-17 in favor of UMass Lowell. Quinnipiac took an early 3-1 lead in the third set, but UMass Lowell would bounce back to take the game in straight sets, taking the third set 25-19. In the defeat, freshman Sierra Dawson led the Bobcats with 18 assists and 13 digs. “I think we struggled with passing and hitting, but I think it got mental at the end,” Dawson said. “We did not pass the ball very well and we could not sign out,” Czaplinski said. The victory for the River Hawks was their first of the season after dropping their first four games. Kylee Chun had a game-leading 29 assists for UMass Lowell, while senior Hannah Rey chipped in with 18 digs. “[UMass Lowell] had a lot of big hitters and big blockers, and that definitely got in the heads of our hitters,” Dawson said. Quinnipiac falls to 1-3 on the season with the loss. The Bobcats next game is Friday, when they will begin play in the Providence College Invitational in Baltimore.